For many years it has been a common practice to add antibiotics to food animal rations (poultry, pigs and to a lesser extent cattle). The rationale is that said antibiotics, even if they are in too low a concentration to actually treat any disease, act as growth promoters leading to btter and faster slaughter weights. The mechanism whereby they do this is unclear. It may be by suppressing the growth of pathogenic bacteria, by treating subclinical infections or by promoting the growth of mutualistic bacteria. No matter what the mechanism there is a downside to this common practice ie the promotion of bacteria that are resistant to not just common antibiotics but also to such "last choice" therapeutics as vancomycin or methicillin.This is because these antibiotics are similar to those used as "growth promoters" in animal feed. The sub-optimal concentrations of such additives is almost gauranteed to promote antibiotic resistant bacteria.This connection has been amply demonstrated in the scientific literature of the last decade. The demonstration of the promotion of resistant bacteria is now a matter of major concern in public health. This means that various jurisdictions are trying to curb this use (misuse ?) of antibiotics or to ban it entirely. The Swedish example of a total ban is instructive. While there was an initial drop in productivity during the 1986 ban on growth promotant antibiotics the deficit in production was soon made up as farmers paid attention to other facters of production such as hygiene, reduction of stress and other management practices such as "all in all out". The present opinion is that antibiotics have no benefit as growth promoters if of producion are optimized. This has been the experience of Sweden. The latest country that has opted for a total ban is Denmark, and an editorial (page 440) and article (pages465-466) describe how another country, Denmark, is in the process of such a ban. The articles describe how the ban was faciliated in that Danish farmers are almost all members of the Danish Agriculture and Food Council. I do not wish to oveemphasize the role of this body, but it undoubtedly a major factor in the elimination of food additive antibiotics in Denmark. The actual article in Nature (June 2012, Vol 486,pp 465-466) tells how the ban was implimented, and gives proof of the harm done by sub-therapeutic antibiotics, and it also describes how the argument from production is false . If a person is farming as they should, with proper feed, housing, disease treatment and nutrition then antibiotics add NOTHING to production. 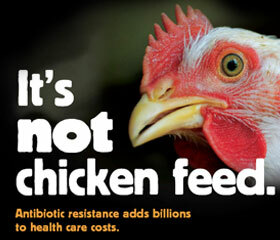 In other words if you are a good farmer antibiotics will add nothing to your operation.Do I have to say it again ? You will find information about Bloggingbooks on our homepage bloggingbooks.net. The best way to get in touch with me will be per e-mail.